Post-show at the Valentino Spring 2018 menswear presentation, during Paris Fashion Week in June, the models emerged wearing branded t-shirts spelling ‘VLTN’, a reinterpreting of a Valentino logo in the 1980s. Slogan t-shirts have long been the bread and butter of many fashion brands and it should be noted Valentino are also buying into this simpler form of attracting sales; the reemergence of slogan t-shirts has been linked with fashion’s servitude to ‘millennials’, or rather their money. This collection wasn’t for ‘older men’, whom luxury menswear used to market itself for. 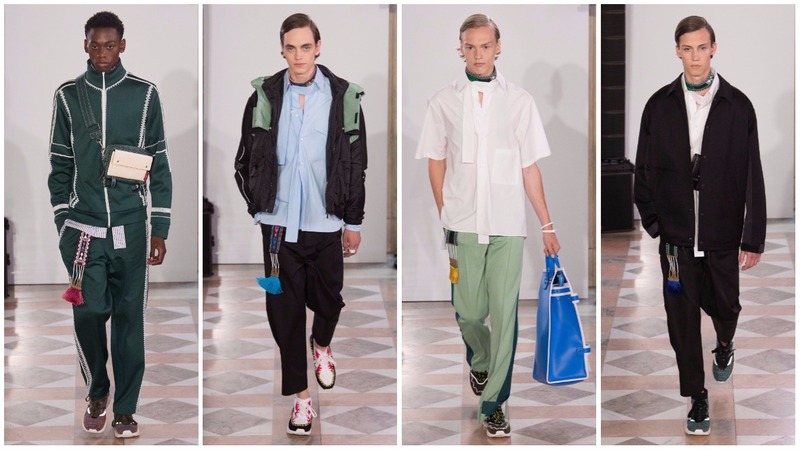 Instead, this was a collection dominated by stylised tracksuits, casual chinos with creative pleating on the ankle, embellished anoraks and trainers. Pier Paolo Piccioli having assumed the position of sole creative director at the house has imposed a youthful verve on the house. His womenswear is lighter, less princessy than it was with his former design partner. His menswear is simply memorable, with his collections packing a punch and offering a closer look at how the men of today are dressing. Motifs that caught ones eyes were the belts with ‘tribal’-inspired designs on them. Tracksuit jackets and trainers boasted similar patterns. Perhaps they were inspired by African, Native American or other cultures. This wouldn’t be the first time the house of Valentino has explored the cultural touchstones of far-flung regions before, but it also veers into appropriative territory. Appropriation and poor representation appear to be recurring issues for the house. For Spring 2016 they designed an ‘African-inspired’ collection which commented on “primitive” and “wild” stylistic motifs. The lineup of mostly white models wearing cornrows drew ire from many corners of the internet. The ensuing advertising campaign, photographed by National Geographic veteran Steve McCurry, also received a bevy of backlash. It had been shot in Amboseli National Park in Kenya and aimed to present the beauty of African culture but used mostly white models to convey this message. For Fall 2016, Steven Meisel captured their campaign of all white models in a gothic ballet-inspired shoot. Spring 2018 menswear is punctuated by this borrowing, appreciation of culture but the reason it edges into appropriative territory is the lack of inclusivity on the runway. There were six models of colour featured in the show. Mixed messaging is a sign of the times. Designers talk about celebrating other cultures yet fail to include people who come from those backgrounds in their shows. They strive to satisfy the so-called ‘millennials’ but it escapes them ‘millennials’ are most likely to rebuke shows that appropriate and offer weak attempts at representation. Amidst this, the consumerist-baiting t-shirts will sell tremendously.